0301_evlo_evmbtornado216: Singles: News-Editorial: Award-Winning Evansville Photographer: Molly Bartels specializing in editorial, wedding and art photography in Evansville, Indiana. "It's dirty and wet but not damaged. I'm just so grateful they found it," said Judy Hudnall after a military flag, which belonged to her deceased brother, Jim Wolf, was found in a field not far from an Ohio River camp off Nugent Drive near Ellis Park in Henderson County, Kentucky, on Wednesday, February 29, 2012. A strong line of storms moved through the area early Wednesday morning destroying several river camp dwellings. 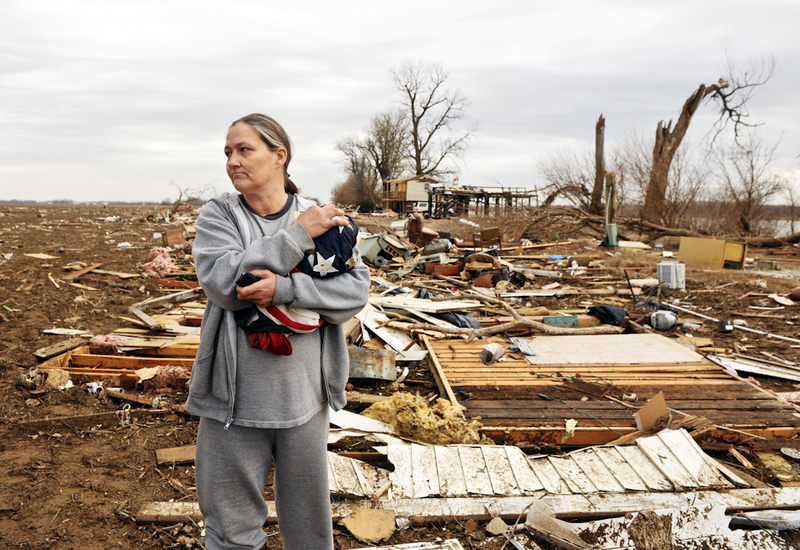 Hudnall's brother, Gene Pickerill, not pictured, was one of the residents who lost his home.